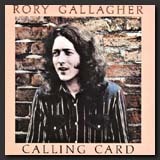 FOR RORY Gallagher to start making any radical departures from established style at this stage in the game would not only be out of character, but also tantamount to musical hara-kiri or whatever the Irish equivalent may be. Predictability is an intrinsic part of Rory’s appeal, and the descriptions which spring to mind – honest endeavor, dedication, professionalism may sound like patronizing clichés, but they are true nonetheless. The fact is that Gallagher is a master craftsman who knows his limitations and is more concerned with striving for lasting perfection within them than making transient innovations. In this respect ‘Calling Card’ is everything you'd expect it to be, but a little bit more too. While Rory is still a firm adherent to the blues and boogie tradition - typified here by songs like ‘Do You Read Me’, ‘Secret Agent’ and ‘Country Mile’, where the rhythm section ticks with the well oiled precision of a Swiss watch and Gallagher launches into his exhilarating left hand runs - there are signs of a greater diversity of mood too and of Rory’s growing stature as a songwriter. ‘Moonchild’ (not the King Crimson song) and ‘Edged In Blue’, for example, are both strong melodies which has not always been Gallagher’s forte in the past. There is an excursion into balladry as well with ‘I’ll Admit You're Gone’ which boasts some exquisite bottleneck guitar playing, but is marred by a rather tremulous and uncertain vocal. The standout track, though, is ‘Jackknife Beat’, a hypnotic blend of subtlety and grit, balanced on the venomous guitar work of Rory and some telling counterpoint piano from Lou Martin which brings to mind the sort of rapport which Lowell George and Bill Payne enjoy. Producer Roger Glover has brought out a crispness in the band's playing which their last outing, ‘Against The Grain’, lacked, and the arrangements allow the other members in the group - Martin in particular - to stretch out more. Gallagher’s guitar playing is as immaculate as ever. He rarely rates a mention in the roll-call of guitar heroes - which is the price of opting for honesty rather than flash - but in terms of style, sensibility and sheer artistry he is probably working closer to his blues origins than nine out of 10 guitarists you'd care to name. Gallagher represents the basics, but as ‘Calling Card’ proves the basics can still come out sounding vital and fresh.